I stepped out of the sputtering rickshaw and onto the dusty road leading to Jama Masjid Mosque. There was a hill to climb, so steep I could only see the tops of the mosque’s two minarets, but the crowd was moving in that direction which made the ascent much easier. 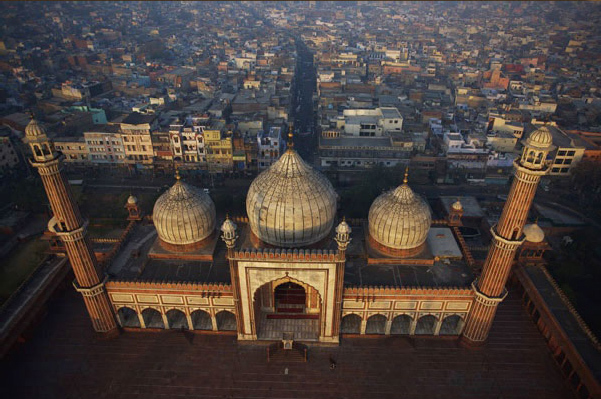 Jama Masjid is the largest mosque in India and one of the most notable in the world. Built during the reign of the Mughal Emperor Shah Jahan in 1628 AD, it reflects the majesty and symmetry of his more famous masterpiece, the Taj Mahal. It’s an anchor in the center of Old Delhi, however, it alone did not provide me with my most lasting impression. As I crested the hill an awesome sight stretched out before me. To the right was the mosque; grand, serene…a beautifully peaceful place. To the left; Chawri Bazaar. Crowded, frenetic, and intimidating in almost every way. Streets crowded with people cut lines through the ramshackle buildings. Merchandise stacked in piles six feet high spilled out from shacks where workmen welded, hammered and polished copper and brass ware. Motors, shoes, pots and pans…While the courtyard of the mosque was quiet, the noise from the bazaar rose up the hill as a muted roar. Everything material needed in this life, contrasting with the emptiness of the mosque. Peace reigned there. I watched the two scenes below me and saw the manifestation of heaven and earth. I had never before experienced such a clear example of the differences between the spiritual world and the human world.